Distributed Power Electronics Going Solar. AC Microinverters vs. DC Maximum Power Point optimization. “Transforming Solar Installation with New Inverters and New Electronics” was the theme for the Wednesday, May 13, 2009, meeting of the Silicon Valley Photovoltaics Society (SVPVS) at the Palo Alto Research Center (PARC). Greentech Media Analyst at Large Eric Wesoff kicked off the event with a summary of power electronics developments in the Photovoltaic (PV) industry. 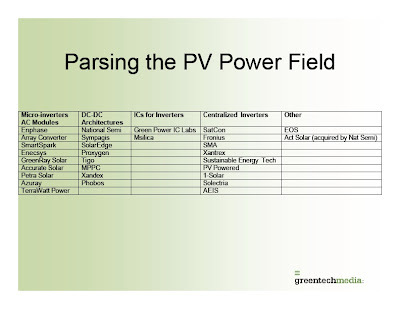 Dominated by start-ups, some eighteen companies are challenging the centralized inverter status quo with new architectures that perform distributed MPPT (Maximum Power Point Tracking) on a per module basis. There are two distributed architecture approaches. Microinverters convert the optimized DC (Direct Current) power output of each PV module into AC (Alternating Current) suitable for grid connection. DC to DC solutions maximize the DC power output of each module regardless of the performance of other modules connected in the same string by compensating for module mismatch, environmental degradation, or shading and route the optimized DC to a standard or cost reduced central inverter for DC to AC conversion. Enphase Energy Co-founder and Chief Technology Officer Martin Fornage presented the Enphase microinverter, touted as the first commercially available microinverter. Mr. Fornage said previous microinverter attempts had failed because of high product costs addressing small PV markets lacking today’s critical mass. Enphase claims to have shipped “tens of thousands” of microinverter units since July 2008 to over 1000 residential and commercial photovoltaic installations. In an Enphase Microinverter System, each solar module is equipped with a microinverter; all the modules are connected in parallel although there is a limitation imposed per branch circuit. Each microinverter performs MPPT on the module before DC to AC conversion near 95% efficiency. to address microinverter critics including direct competitor SmartSpark now renamed SolarBridge (please see “SolarBridge to Launch Microinverters in 4Q” by Ucilia Wang at Greentech Media). In addition, Martin highlighted per module system monitoring as a key strength of their integrated system approach. Each Enphase microinverter communicates module performance data via powerline communications to an Envoy gateway just plugged into the wall of the same electrical system. Enphase demonstrated their Enlighten web interface to review instantaneous power production from an actual PV installation. In this case, one solar module was found to be underperforming the balance of modules in the array by about 30%. For more information, I suggest downloading the Enphase Micro-inverter System presentation (old microinverter dash spelling) from the 2nd Annual AEE Solar Dealers Conference in Mesa, Arizona, February 2009. Per “Suntech Brings Enphase Micro-Inverter Technology to Its U.S. Authorized Dealer Network”, Enphase has a 1 MW (MegaWatt) initial order in a US distribution deal with Suntech Power Holdings Co., Ltd. (NYSE:STP). Enphase is also working on AC modules, and “Enphase Energy Announces Agreement with Akeena Solar” is the first such partnership for almost 20 MW of microinverters over a two year period. In his presentation, Tigo Energy Vice President, Marketing and Sales, Jeff Krisa reviewed the PV system performance problem statement and Tigo’s efforts to retrofit existing best in class PV systems to gather operating data and validate Tigo’s approach to distributed DC MPPT per module. Today’s mesh PV arrays consist of serial module strings connected in parallel to a centralized inverter. PV module mismatch introduces system inefficiency; the weakest link module determines the string current and has a disproportionate impact on overall PV system performance whether the mismatch is caused by project, environmental, or lifecycle factors. If you are going to maintain the peak output, regardless of where you are in irradiance, the voltage levels will always be the same. So the key is to have a consistent voltage in an existing array, and if you have that consistent voltage, you will most likely be managing to an optimal power. When Tigo first approached prominent installers to audit system performance and validate their theories, most installers did not believe they had a performance problem. We know how to architect a system was their response. Nonetheless, an existing best in class 100 kW (kilowatt) PV commercial rooftop installation located in Berkeley, California, was retrofit for data collection of each module’s voltage, current, irradiance, and temperature. The retrofit results revealed a surprising 15% distribution in module power output instead of the expected flat and narrow distribution. In addition, one module was found to be in constant bypass mode requiring warranty replacement. Without per module monitoring, the faulty module would never have been discovered. These results convinced Gary Gerber, President & Co-Founder, Sun Light & Power Company, that Tigo was onto something, and he is now on Tigo Energy’s Board of Advisors. At another PV installation retrofit in Santa Cruz, California, a cloud moving across the PV array for two seconds was observed to cause a three minute long power output drop due to inverter instability. In a side by side test installation, Tigo setup two strings of thirteen (13) 180 Watt Suntech modules at their facility; one was equipped with a string inverter and the other with the Tigo distributed DC system. The Tigo system delivered 6-8% (up to 20%) improvement in power output versus a string inverter under the same conditions. 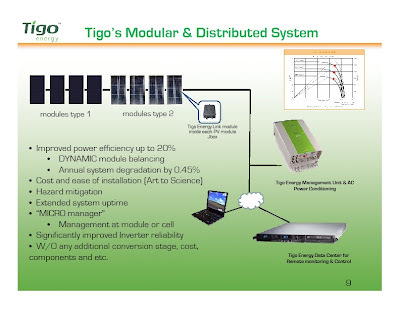 However, Jeff also highlighted differences between the Tigo distributed DC system and Enphase. Tigo places a very small footprint of electronics, called the Tigo Energy Module Maximizer, at each module for MPPT and communications. Low component count drives the inherent reliability of the approach for eventual integration into the module. A centralized inverter is retained though it can be simplified to just perform DC to AC inversion and connect to the grid. The Tigo Energy Maximizer Management Unit (MMU) communicates back to the modules enabling more precise system control and acts as a gateway back to the data center. Mr. Krisa claimed the low cost Tigo system could scale with inverter capacity to address both the $0.75-0.80 residential and $0.25 solar farm PV Balance of System (BOS) budgets at high conversion efficiencies (97.5% in single stage European transformerless topology). We have several contracts and a lot of development work going on with module manufacturers where the DC power electronics will go right into the junction box. While “Shade Happens” may be the refrain, National Semiconductor Corporation’s (NYSE:NSM) SolarMagic lacks the per module performance remote monitoring capability of both Enphase microinverters and Tigo’s Energy Module Maximizer. Without this feature, a SolarMagic equipped module could be defective, and the PV system installer or operator might never even know it! In the SolarMagic FAQ entry, What is the difference between SolarMagic power optimizers and microinverters?, SolarMagic is positioned as the ideal solution for retrofit applications. This may be their best market opportunity since central inverter optimizations are not leveraged. The Enphase answer to the same question is per module monitoring and DC to AC conversion at a lower price. The first generation Enphase M175 microinverter costs $165 at GoGreenSolar.com versus the comparable $199 SolarMagic list price. The 15 Volt minimum Input Voltage Range implies a fully shaded panel is compensated for by other string modules fitted with SolarMagic. SolarMagic would only be active if one or two diodes of the typical module are bypassed, not all three. I understand there are multiple SolarMagic products to address diverse PV module specifications, but I have yet to see a datasheet. By the way, neither the Tigo Energy™ power electronics system for modules nor the SolarMagic Power Optimizer made the Cell Award Short List for the unrepresentative Best technical product for module assembly Category. I am expecting conflicting Lies, Damned Lies, and Specs regarding solar power electronics from companies at Intersolar 2009 this week. Warranty and reliability claims will be at the forefront. Thus far, my impression is the Enphase microinverter is an attractive, scalable power electronics solution for residential and small commercial rooftops. Meanwhile, Tigo’s Energy Maximizer system seems to better address the low cost BOS requirements of large commercial and utility scale PV installations. ps. please forward if you have an idea. My biggest complaint is that they charge $2 per inverter per year to see the output of the inverters. I have 21 inverters, so $42 per year, and the system only generates $500 per year in electricity per year. That’s almost 10% per year just to see the output. I tried to search their web site to find out what they charge before I bought the things, but they had no info on what they charge. It was only until after I had installed the inverters that Enphase called me to register the inverter interface, and only after I asked what they charge did I get an answer. Unfortunately, with these inverters installed under the panels on my 2 story house, it would be very difficult to change inverter manufactures. So now if I want to know the output, I have to pay them $42 per year! If I had known this I would not have bought these!